Born in Abadan, Iran to Armenian  parents, at the age of seven Baboumian, along with his mother and grandmother, emigrated to Hattenhof, Germany. 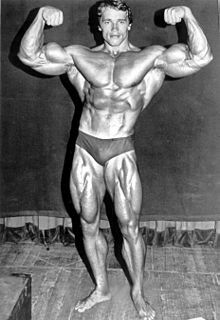 By the age of nine Baboumian had developed an interest in weight training, which led him to pursue bodybuilding as a young man. In 1999 he won the IFBB German junior bodybuilding championship, and in 2002 he became the overall junior champion at the Gießen Campions-Cup. Baboumian currently holds the world log lift record in the 105k-category (165 kg), as well as the German heavyweight loglift record (180 kg) and the title of "Strongest Man of Germany" (105 kg division). Since 2006 he has been competing at IFSA Strongman events. In 2007 Baboumian competed at the FSA -105 kg World Championships and ended up with a 14th place. Iranian-Armenians also known as Persian-Armenians, are Iranians of Armenian ethnicity who may speak Armenian as their first language. 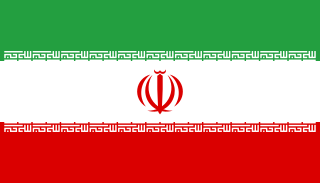 Estimates of their number in Iran range from 70,000 to 200,000. Areas with a higher concentration of them include Tabriz, Tehran and Isfahan's Jolfa quarter. The International Federation of Strength Athletes was an international governing body for strongman competition. IFSA operated from 1995-2007 and was based in Glasgow, Scotland. The bench press is an upper-body strength-training exercise that consists of pressing a weight upwards from a supine position. The exercise works the pectoralis major as well as the supporting chest, arm, and shoulder muscles such as the anterior deltoids, serratus anterior, coracobrachialis, scapulae fixers, trapezii, and the triceps. A barbell is generally used to hold the weight, but a pair of dumbbells can also be used. In strength training and fitness, the squat is a compound, full-body exercise that trains primarily the muscles of the thighs, hips and buttocks, quadriceps femoris muscle, hamstrings, as well as strengthening the bones, ligaments and insertion of the tendons throughout the lower body. Squats are considered a vital exercise for increasing the strength and size of the legs as well as developing core strength. Squats are typically used to tone back, thigh, and hip stability. Isometrically, the lower back, the upper back, the abdominals, the trunk muscles, the costal muscles, and the shoulders and arms are all essential to the exercise and thus are trained when squatting with the proper form. The deadlift is a weight training exercise in which a loaded barbell or bar is lifted off the ground to the level of the hips, then lowered to the ground. It is one of the three powerlifting exercises, along with the squat and bench press. Bodybuilding is the use of progressive resistance exercise to control and develop one's musculature for aesthetic purposes. An individual who engages in this activity is referred to as a bodybuilder. In professional bodybuilding, bodybuilders appear in lineups and perform specified poses for a panel of judges who rank the competitors based on criteria such as symmetry, muscularity, and conditioning. Bodybuilders prepare for competitions through the elimination of nonessential body fat, enhanced at the last stage by a combination of intentional dehydration and carbohydrate loading, to achieve maximum muscular definition and vascularity, as well as tanning to accentuate the contrast of the skin under the spotlights. Bodybuilders may use anabolic steroids and other performance-enhancing drugs to build muscles. Francesco Columbu is an Italian actor, author, former champion bodybuilder, powerlifter and World's Strongest Man competitor. Jón Páll Sigmarsson was an Icelandic strongman, powerlifter and bodybuilder who was the first man to win the World's Strongest Man four times. He is regarded as one of the greatest strongmen of all time, and is credited with developing Iceland's national identity. He was named Icelandic Sportsperson of the Year in 1981, and was one of the best-known Icelandic athletes. In 2012, Jón Páll was inducted into the World's Strongest Man Hall of Fame. Svend Viking Karlsen is a Norwegian former strongman, powerlifter, and IFBB professional bodybuilder. He is well known for shouting his catch phrase "Viking Power!" during competitions. A strongwoman is a woman who performs feats of strength in a show or circus, or a woman who competes in strength athletics. Traditionally, strongwomen have had a special appeal, as women involved in demonstrated feats of strength were exceptions. Žydrūnas Savickas is a Lithuanian powerlifter and professional strongman. He is considered by many to be the greatest strongman competitor of all time, having been the only modern competitor to have won every current major strongman competition. He stands 1.91 m tall and competes at 155 kg (342 lb) to 182 kg (401 lb). Johnnie Otis Jackson is an American IFBB professional bodybuilder and powerlifter. Jackson has been said to have one of the best developed upper bodies in professional bodybuilding in the world. He is known for training in Arlington, Texas, with fellow American IFBB pro competitor Branch Warren. Due to his strength, he has sometimes been referred to as the world's strongest bodybuilder. Derek Poundstone is an American former professional strongman athlete from Woodbridge, Connecticut. Derek Poundstone is also a police Sergeant for the Naugatuck, Connecticut Police Department and is the former owner and landlord of an apartment complex and gym. The Arnold Strongman Classic is an annual competition featuring strength athletes from all over the world. Created by Arnold Schwarzenegger and Jim Lorimer, it is an offshoot of the Arnold Sports Festival which takes place annually in Columbus, Ohio, USA. The Strongman Champions League is a strongman competition circuit, with several grand prix events throughout the year and the Strongman Champions League overall champion title going to the overall winner at the end of the season. The competitors include some of the top athletes in the sport, including Žydrūnas Savickas, Krzysztof Radzikowski, Travis Ortmayer, Nick Best, Mikhail Koklyaev, Ervin Katona, Andrus Murumets, Laurence Shahlaei, Vytautas Lalas and Terry Hollands. Initially in close partnership with IFSA, it quickly asserted its independence and has acted as a unifying force in the world of strength athletics, bringing together athletes from IFSA with those affiliated to the World's Strongest Man circuit, and having close cooperation with other major events such as Fortissimus. In 2012, SCL began co-promoting the new Arnold Strongman Classic-Europe contest which will become part of the annual SCL season of events. Benedikt Magnússon is an Icelandic strongman and powerlifter. He holds the raw deadlift world record of 461 kg (1,016 lb). He was previously the holder of the world record for the heaviest strongman deadlift with a pull of 461 kg (1,016 lb) until Eddie Hall lifted 462 kg (1,019 lb) in 2015. Hall later increased the latter record to 500 kg (1,102 lb). 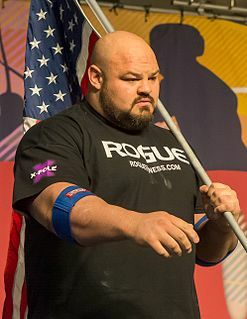 Brian Shaw is an American professional strongman competitor and winner of the 2011, 2013, 2015 and the 2016 World's Strongest Man competitions. Shaw is also the first man to have won the Arnold Strongman Classic and the World’s Strongest Man contest in the same calendar year, a feat he accomplished in 2011 and then replicated in 2015. Stan "The White Rhino" Efferding is an American IFBB professional bodybuilder and a powerlifter competing in the Southern Powerlifting Federation (SPF). He held the all-time raw world powerlifting records in the 275-pound-class in the Total without knee wraps and in the Squat without knee wraps (854 lbs). Due to his enormous physical strength, regularly competing in professional powerlifting contests along his career in professional competitive bodybuilding, Efferding is often referred to as the "world's strongest bodybuilder". Ervin Katona is a leading Serbian strongman competitor and regular entrant to the World's Strongest Man competition. Katona is ethnic Hungarian. Jimmy Laureys is a Belgian powerlifter and strongman competitor. Hafþór Júlíus Björnsson is an Icelandic professional strongman and actor. He is the current World's Strongest Man and is the first person to have won the Arnold Strongman Classic, Europe's Strongest Man and World's Strongest Man in the same calendar year. He plays Gregor "The Mountain" Clegane in the HBO series Game of Thrones. He also is a former professional basketball player. The 2012 World's Strongest Man was the 35th edition of World's Strongest Man. The event was held on the grounds of the Commerce Casino in Los Angeles, California, US. The event was sponsored by MET-Rx. The qualifying heats were held from September 24–27, and the finals took place Sept. 30 & Oct. 1, 2012. The winner was Žydrūnas Savickas, it was his third WSM title. Vytautas Lalas of Lithuania was second, and Iceland's Hafþór Júlíus Björnsson was third. Chris Gearing is a British strongman competitor, notable for having won the England's Strongest Man title and having competed at the World's Strongest Man. Luke Skaarup is a professional engineer and also a retired professional strongman from Canada who competed actively in the sport of strongman from 2007 to 2015. During his competitive career, he held many records, most notably the Canadian record for heaviest atlas stone ever lifted in competition, the Ontario record for heaviest deadlift (780lbs), and the Ontario Record heaviest dumbbell press (230lbs). He competed in over sixty competitions with his top placings being the 2 x Ontario's Strongest Man Champion, 4th at North America's Strongest Man (2014), and 8th at the World Amateur Strongman Championships (2012). Graham Hicks is an English strongman competitor who placed second as Britain's Strongest Man for 2014 and 2018. Graham Hicks is the 2019 Britain's Strongest Man edging out Adam Bishop. Matjaz Belsak is a Slovenian professional strongman competitor and powerlifter. 1 2 "Vegan strongman shoulders 550 kg — a record, perhaps — at vegetarian food fest". Toronto Star . 8 September 2013. Retrieved 6 February 2018. ↑ "Vegan Strongman Patrik Baboumian Breaks His Own World Record!" . Retrieved 2016-07-17. ↑ "'Strongest Man' Eats Plants, Loves Animals". PETA . 21 November 2011. Retrieved 6 February 2018. ↑ Deutsche Strongman Meisterschaft 2011. 8. August 2011. ↑ Flashreport Deutsche Strongman Meisterschaft 2011. Wettkampf Bericht von Body-Xtreme. Abgerufen am 8. August 2011. ↑ Patrik Baboumian wird Europameister Raw-Powerlifting EM (GPA) in Finnland . Wettkampf Bericht abgerufen am 10. Juni 2012. ↑ Zeitungsbericht Hamburger Morgenpost – MOPO. Abgerufen am 19. August 2012.